The tassel and horn used prior to 2010 is not a coat of arms. It was the badge for the office of Huntsman that Sir John held and passed on to his descendants. It is currently used by a woman in England who holds the office. (see page x in Volume I of the Doane Family) The DFA continued to use it (since it was not a coat of arms) until we learned we are not of this line at all. See page 1 (one) in Volume II at the bottom of #540. We have since done extensive DNA testing and have so far identified six families of Dones in England and we are not of any of them. The Doane Family of America had a logo contest in 2009. The winning design, our new logo, was unveiled at the DFA Reunion at Doane College July 19th 2010. The winner is Todd J. Doane of Carrollton, Texas. He is the DFA regional vice president from Texas where he lives with his wife Vanessa and son Alex. Todd attended the reunion to receive the honor along with his parents and brother. At the reunion Todd gave a Powerpoint presentation to the membership in attendance in which he described the ideas that influenced his design and the meaning of the symbols in the logo. "The competition combined two of my passions for design and genealogy. It is a real honor to have my work represent the Doane Family Association hopefully for generations to come" said Doane. GOD - the (SUN) representing the light of the world. It is probable that Deacon John came to America to escape religious persecution. Faith in God and fellow man is the foundation of the country. Other icons include a cross and a Bible. FAMILY - the (TREE) a particular pear tree, with branches, fruit, and the stars representing progeny. There is a poem written by Herman Doane about a pear tree transplanted to Cape Cod from England around 1630 by Thomas Prince that bore fruit for over 200 years. CHARACTER - the (ROCK) is a visible symbol of solidity; steadfast and resolute. The Doane Rock is located on the original property of Deacon John Doane in Cape Cod, Massachusetts and is the largest exposed glacier boulder in the region. WISDOM - education is the beginning of enlightenment. Doane College was founded by Thomas Doane in Crete, Nebraska in the year 1872. 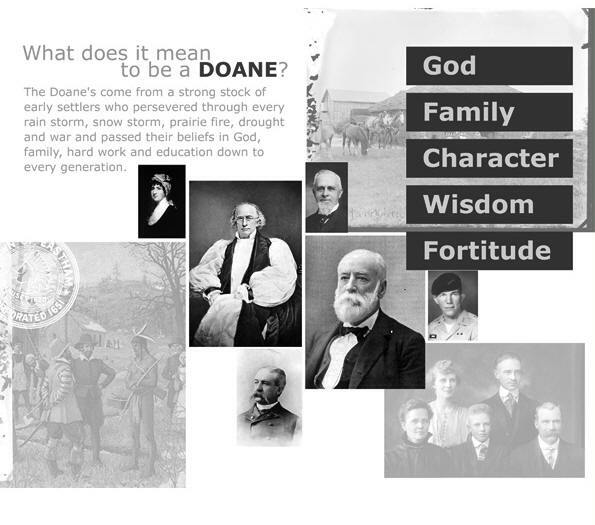 The Doane Family Association (DFA) was formed in 1907 in order to preserve family history, genealogical records (BOOK) are archived at the college. The "F" in DFA forms the (KEY) that will unlock the mystery of the origin of Deacon John Doane. FORTITUDE - symbolized by the agricultural (WHEAT) and fishing industries (ANCHOR) which was the backbone of early American industry. The (EAGLE) is the symbol of America and military service. Doanes have served in every U.S. conflict including the Revolutionary War. On December 6th, 2014, Todd Doane lost his two-year battle with brain cancer. The symbols he designed in the logo also symbolized Todd's life.